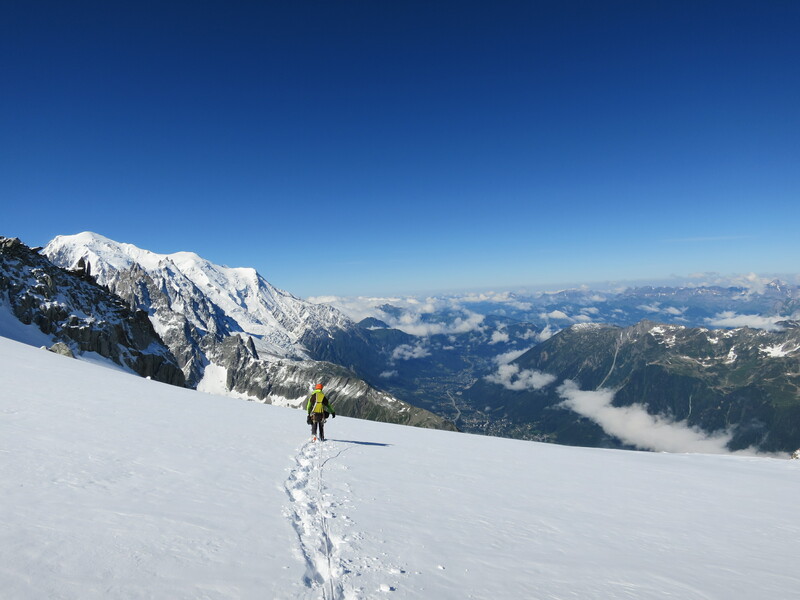 Some describe Brown-Patey as their favourite route in the Mont Blanc massif. That’s very promising when you are picking a line for the next good weather spell. Actually it was one of the big routes on my “to do” list this summer. 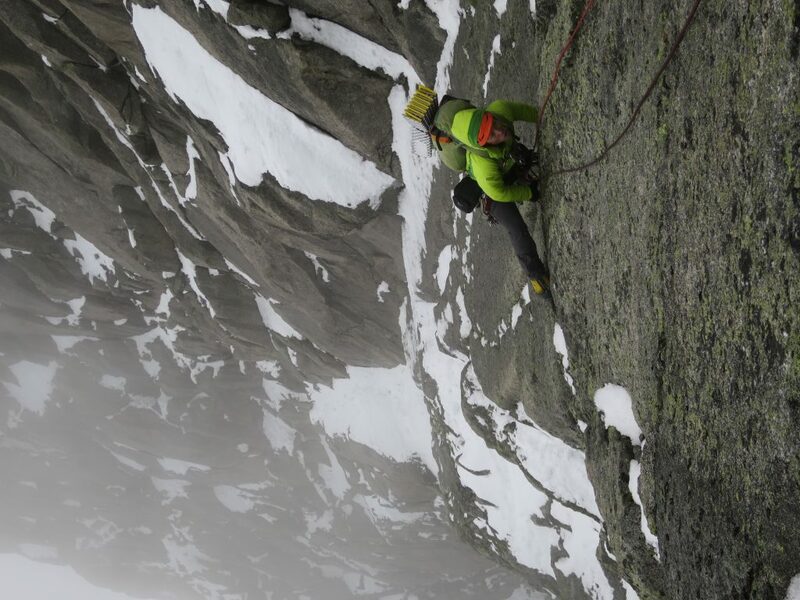 It’s not climbed very often and it combines three very diffirent aspects of climbing. 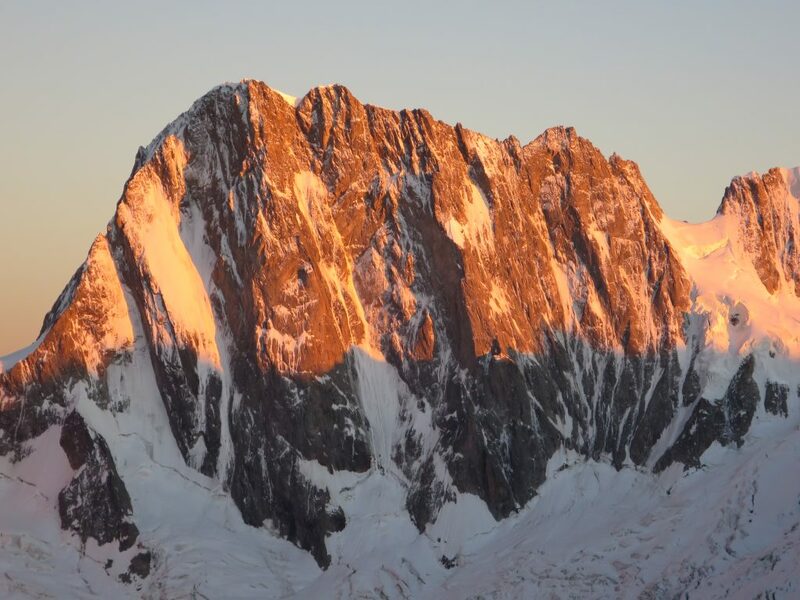 Plus, it covers 1300 vertical meters of rad alpine terrain on the Sans Nom face of the Aiguille Verte. 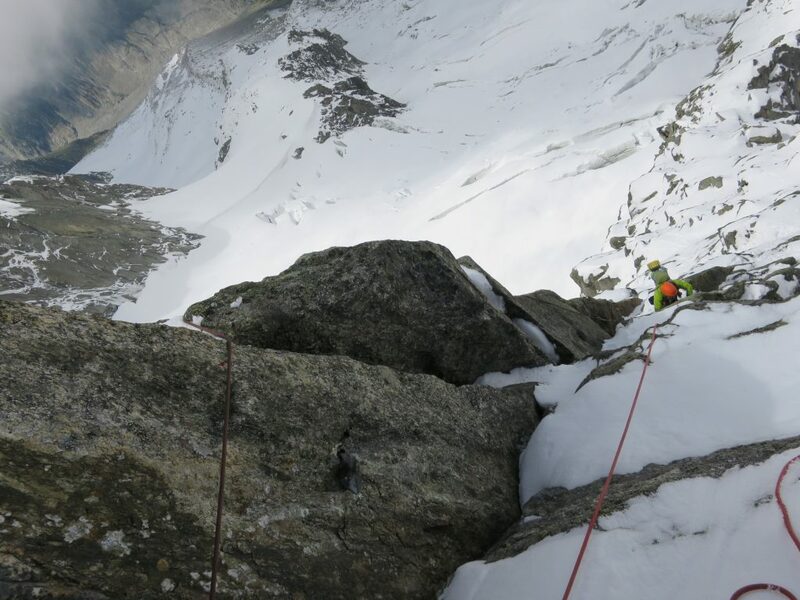 The first part of the route climbs 400m high rock spur to reach the hanging glacier. 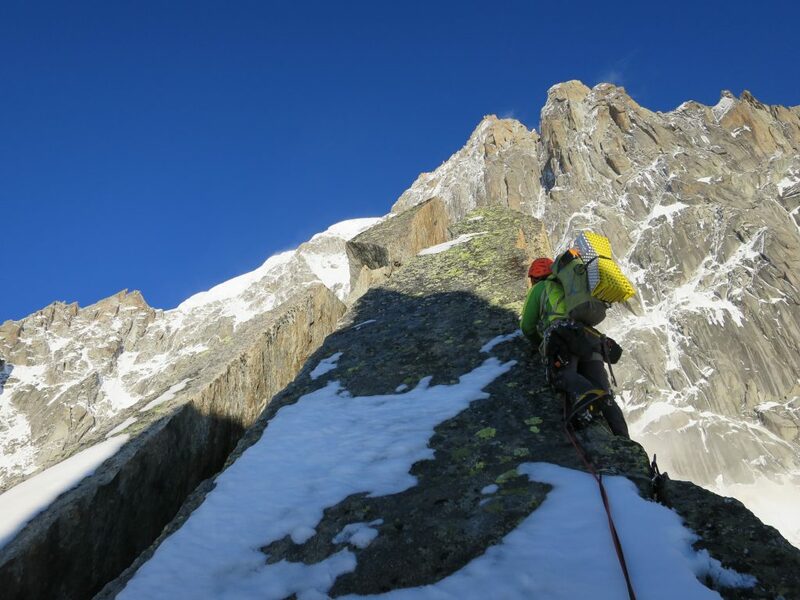 Most teams bivouac on the ledges to climb the upper face next day. 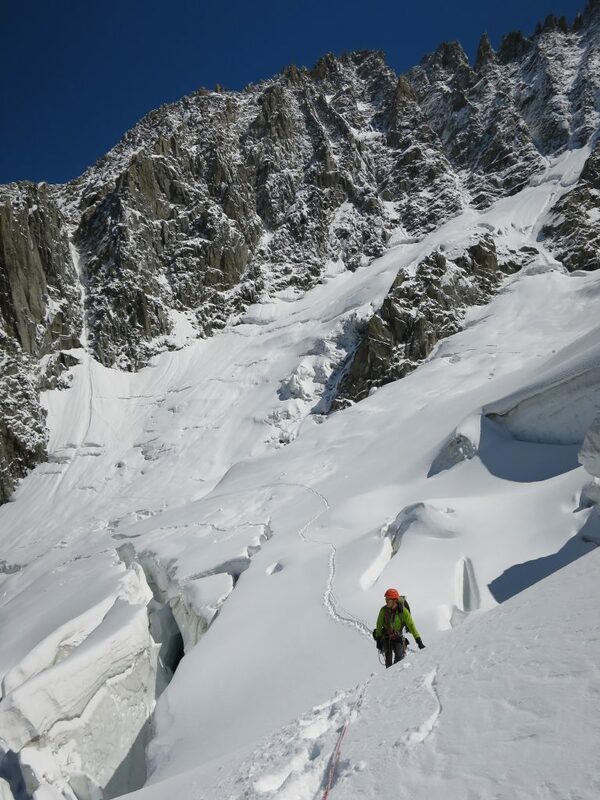 The second, ice and snow climbing part ends to a “belle goulotte” also known as “Marsigny-Mohr exit” to the Breche de Sans Nom. Then you just climb the Arete Sans Nom to the summit of Verte. Original route follows steep cracks more on the left, but the most natural and enjoyable line takes the Marsigny-Mohr variant. A big, four day storm had just hit the massif, bringing snow as low as 2000m in the middle of July! 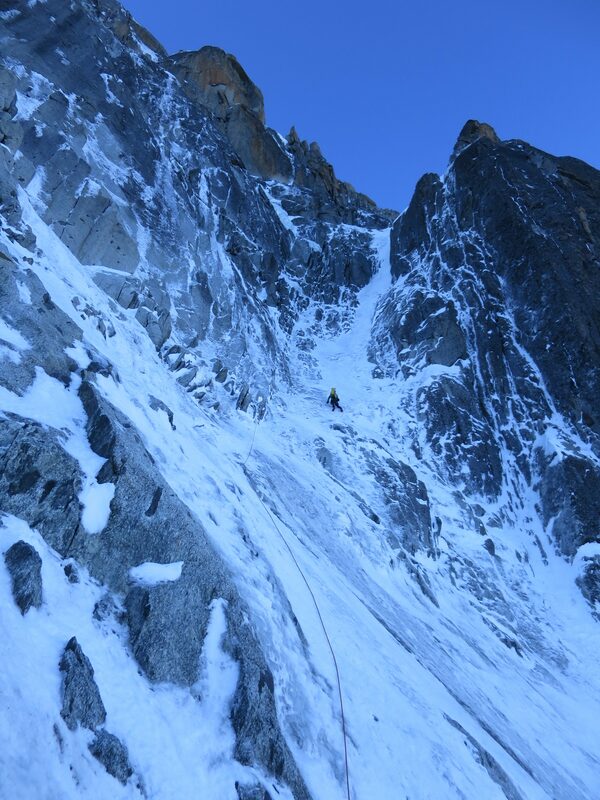 I was very eager to climb something longer than basic Midi S face stuff and so was Chamonix based Tim Oliver. Most of the climbers would have stayed away from the snowy Sans Nom face, but luckily we shared the idea of climbing the Brown-Patey. We knew that if we wait any longer, it will become too hot to climb on the face any time soon. So, we were off on the first clear day after the storm. Tim breaking the trail from GM. Wintery Sans Nom face and Les Drus. Approach was quite relaxed 2 hour downhill from the GM lift. Nant Blanc glacier was filled with snow and the couloir leading to the glacier in good condition. At places there were 20cm of new snow which didn’t promise very quick climb to the bivouac area. Actually seemingly strong winds hitting the summit and creating big spindrifts made the situation very wintery. How strange! Four rappels down to Nant Blanc glacier. Nant Blanc glacier felt remote despite the short approach. In a proper summer conditions the spur should be doable in a few hours, but now everything was covered with snow. Dry-tooling 5b slabs? Yes, please. The crux 6a pitch was probably the easiest of the day as it was free of snow. At 10pm we finaly reached the bivouac site. It took ages to climb 400 meters! The fun begins. First grade 5 pitch promised difficult conditions. Tim following. Snowy 5b slab with spaced protection was probably the crux of the first day. Tim climbed it without crampons. I dry-tooled. Actually the climbing itself was really fun, but we just expected shorter day. I didn’t sleep very well on a crumbly ledge, which was a shame, because we still had another long day ahead. 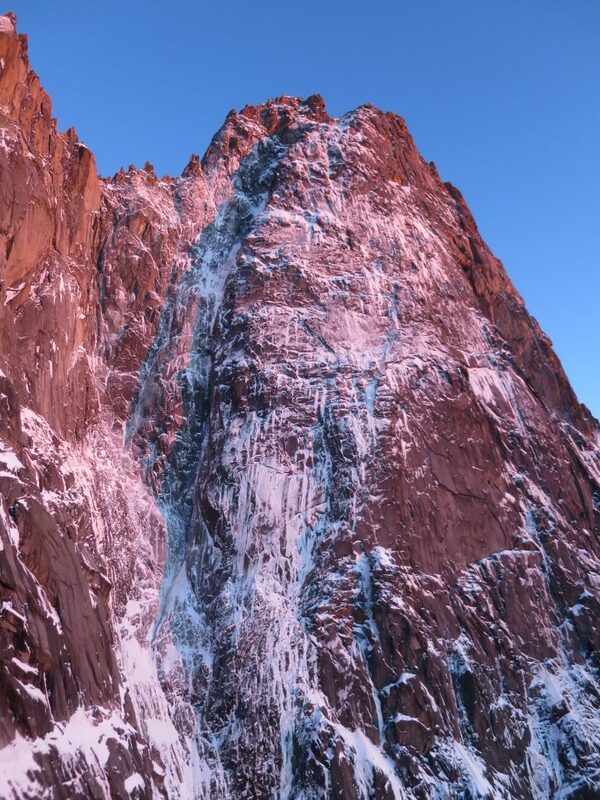 At 6am we begun simul-climbing the next section of the face. Now conditions were good and we quickly climbed all to way to the Breche de Sans Nom swaping leads only one time. It felt great to be middle of the big alpine face again. 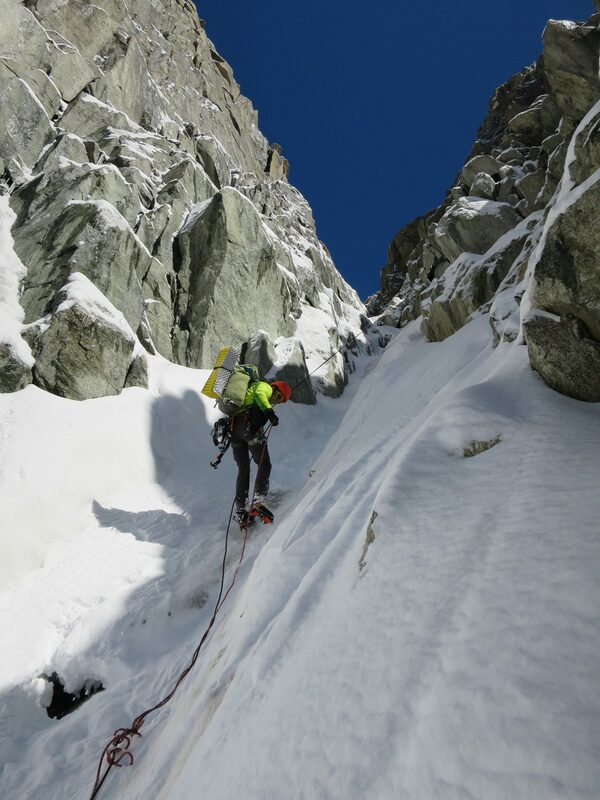 Tim entering to the Marsigny-Mohr couloir. However, the lower part of the Sans Nom ridge offered more difficulties and we pitched the whole thing. Blocky mixed climbing combined with snowy cracks on smooth walls. I violently french-freed the 6b crack to save time. With rock shoes it wouldn’t be a problem to free it, but you have to sensible. 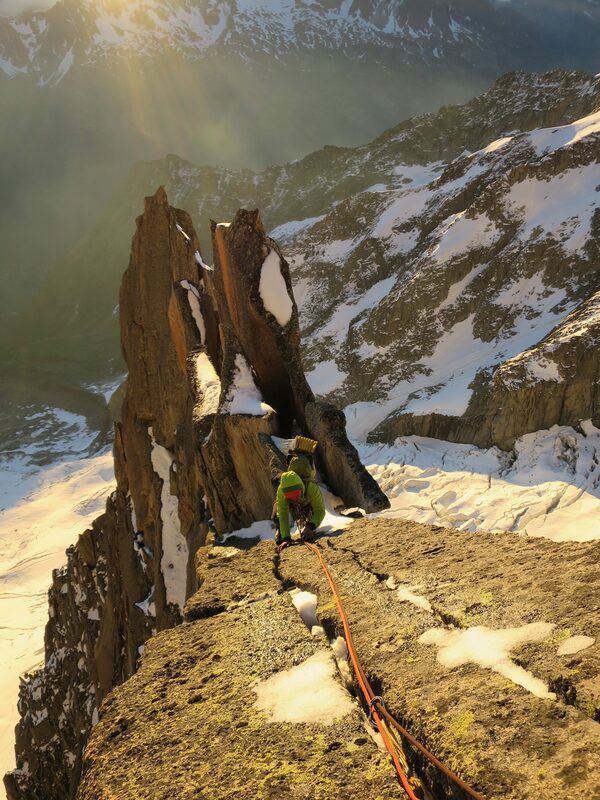 And how there can be 6b rock climbing on a D graded alpine route? Time to change grade for the Sans Nom ridge mates! 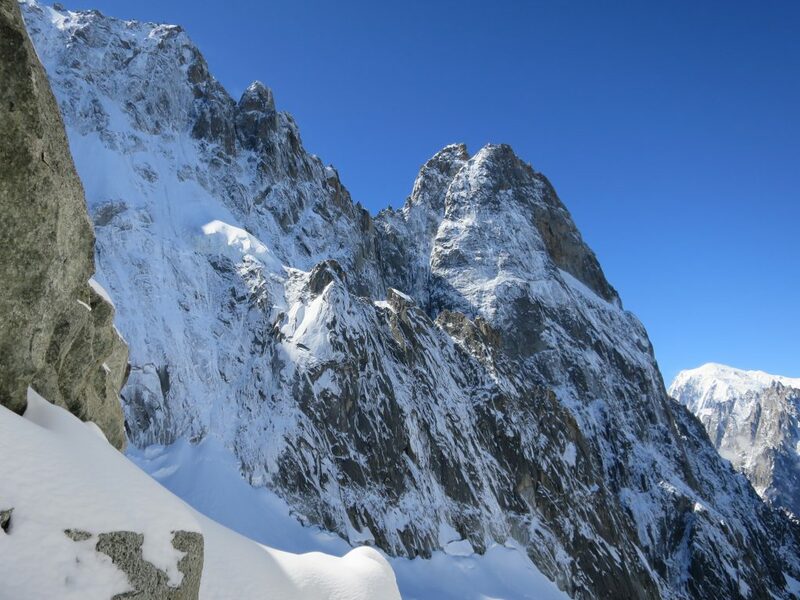 The upper arete is spectacular – golden granite towers rising from a knife-edge snow ridge. Absolutely stunning! Wind was still raging strong and at times, it was hard to keep the balance. 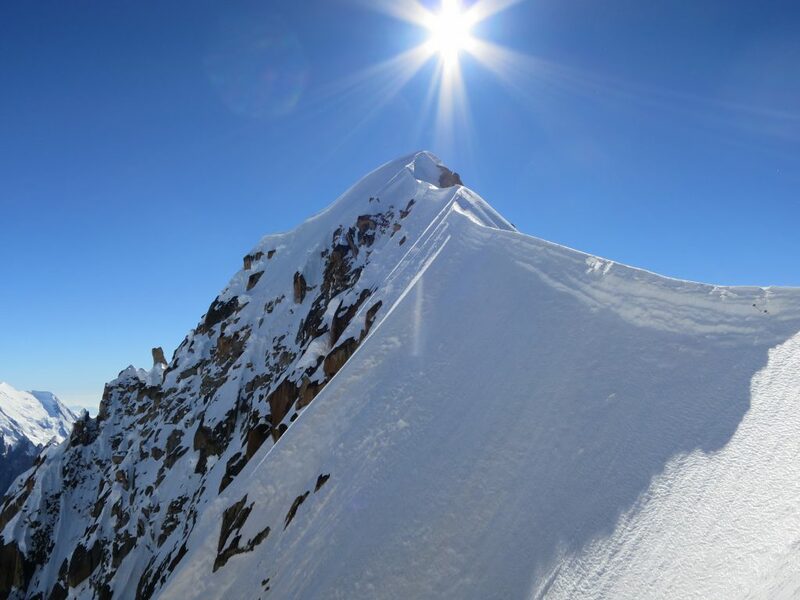 Soon we stood on the summit of Aiguille Verte. It had been a beautiful trip to climb one of my favourite peaks. I had tried it three times in the past. As a young boy I tried to solo the Whymper, but bad conditions forced to go down. A year later my plan was to solo the Couturier, but again conditions weren’t favourable. And last Autumn my friend got injured slightly while climbing the “Late to Say I’m Sorry” on the N face. Such a good feeling to reach the summit after all those failures! The only photo I took after the Breche de Sans Nom. Very windy day! First rappel from the col. 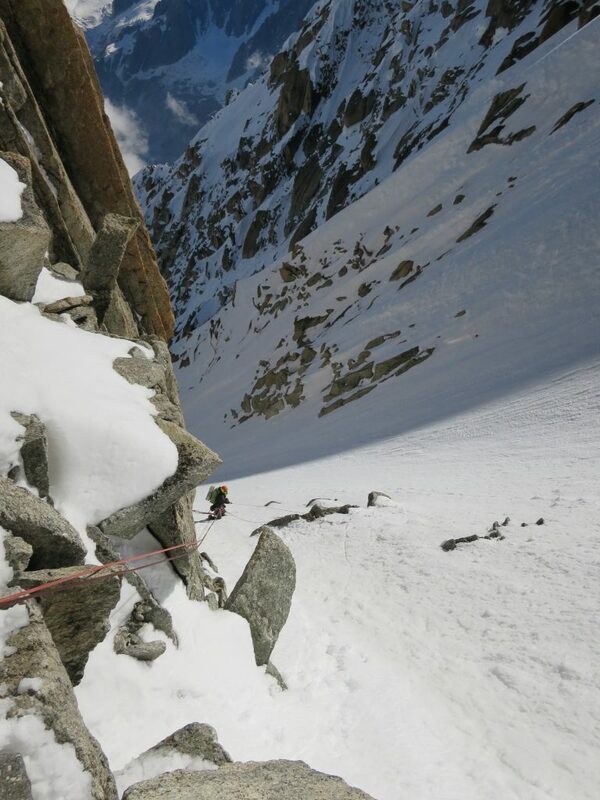 The descent via Whymper couloir was uneventful. Untracked Moine glacier offered nice sunset views over the Jorasses as we walked down to Couvercle. Thanks for the late-evening cake and soup! Another beautiful day on the mountains was over! My favourite face in the massif!